That’s a wrap! Apple made a lot of announcements today. Here is our entire coverage on TechCrunch and a small recap of what happened during the keynote. As expected, Apple unveiled a brand new device, the iPad mini. Even though everything shown was widely anticipated, watching Apple’s take on the smaller-sized tablet market was interesting. That’s why Phil Schiller threw some punches at Android tablets. As the iPad mini has the same aspect ratio and resolution as the iPad 2, apps will simply be shrunk down versions of iPad apps. iOS developers won’t have to do anything. Pre-orders will start on October 29. Read the hands-on post with the iPad mini. Apple surprised us a little with this one. While an updated iPad with Lightning was expected, a completely new generation is a good surprise. The fourth generation iPad not only comes with Lightning, but is packed with an A6X system-on-a-chip, and has improved LTE support around the world. All of this comes in the same design and at the same price. With that announcement, Apple may try to shift the release cycle for the iPad. In the coming years, new models may be announced right before the holiday season just like this year. The 13-inch MacBook Pro now has a Retina brother. Just like the 15-inch model, the Retina and non-Retina versions will co-exist for the time being. You can order today, starting at $1699. Read the hands-on impressions. 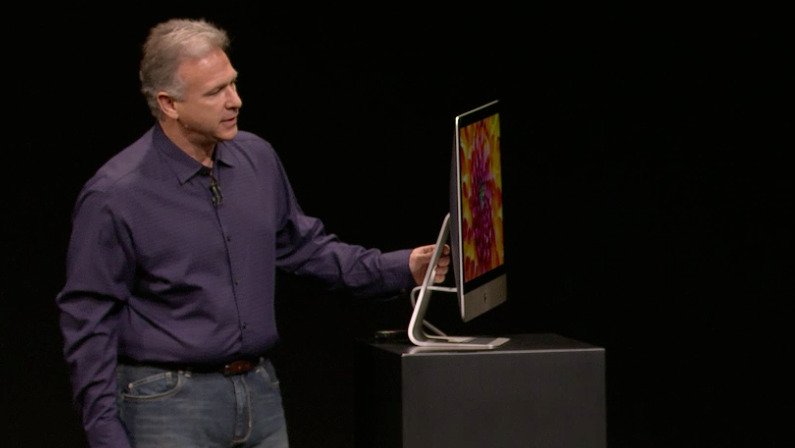 Even though the iMac doesn’t get the Retina treatment, Apple unveiled a completely redesigned iMac. It is thinner on the edge, but the most important addition is the Fusion Drive, which is Apple’s branding for a HDD/SDD hybrid. Read the first impressions about the device. Today’s event was an opportunity to show some love for the Mac. The new Mac Mini isn’t a completely redesigned version but a nice upgrade for Mac Mini users. The Mac Pro is the only Mac that didn’t receive a significant upgrade this year. The company promised a new Mac Pro for 2013. Apple Made No Mention Of iOS 6 Maps Today. Now That’s Boring.